All it took was for one man to come forward and speak about alleged sexual abuse by Afrika Bambaataa. When Ronald Savage told his horrid story of the numerous times he says the hip-hop pioneer sexually abused him when he was a teenager, he got the world's attention. And now, in an interview with the New York Daily News, three other men have come forward with similar stories. Hassan Campbell told the news site that he was only 12 years old when the abuse started. Campbell says Bambaataa would let him stay at his home when he was having troubles at his own home, but says not everything was what it seemed. "He had the most fun house in the world," Campbell, now 39, told the newspaper. "There were celebrities there, musicians, neighborhood heroes. It was the best place to be—and the worst place to be. "He is a pervert," Campbell told the newspaper. "He likes little boys." Another man, who wished to remain anonymous, told the Daily News of similar allegations. "I know what Ronald Savage is saying is true because he did it to me," the now 50-year-old New York man told the News. "I have never spoken to anybody about this, and when I did, I said 'Holy [s—t], they finally caught up to him.'" A third man, identified only as a former New Yorker named Troy, also told the News that Bambaataa subjected him to sexual abuse. "I still have a lot of anger about this," Troy told the News. "I've been dealing with this for years. It's a shame this didn't come out earlier." Campbell said that about seven months ago, he posted a video about his alleged abuse but took it down after Bambaataa and Bambaataa's organization, Zulu Nation, agreed to meet with him. Campbell said that Bambaataa apologized and said he would get counseling and open up a center for abused boys. "He never did any of those things," Campbell told the Daily News. "He's a manipulator and a liar. He's just waiting for this chaos to blow over so he can go back to his dark, dingy hole and go back to his old ways. He needs to put down the candy and let the little boys go." 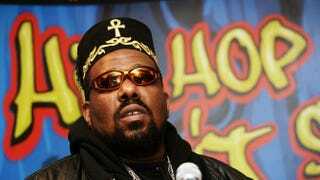 Last week Bambaataa issued a statement denying Savage's allegations. One has to wonder if he'll issue another statement denying the new ones.